Tracie Hi, my name is Tracie. I've been married for 18 years and I'm currently a stay-at-home mom of 4 children with one on the way. Eek! Tracie Last year, I got my first d-SLR camera for my anniversary. I was taking so many pictures that I decided there had to be a way to put them to use. That's what drove me to search online for ways to sell my art. And that's how I discovered Zazzle. 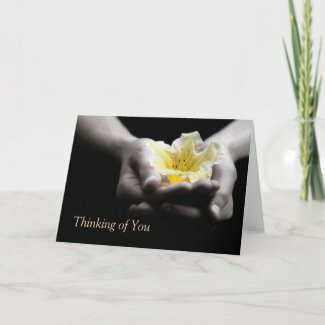 Tracie That would be one of the first products I made, a thinking of you card with a photo of a pair of hands holding a yellow flower. It's special to me because it's my son's hands. Tracie Making things for my store! I love my camera and my computer. Ever since I was little I was always making cards and homemade gifts for my friends and family. I also love to write. Someday I'm even going to finish my novel! Tracie Good question! When I get going on a project, I have a really hard time switching gears, so I actually have to set the timer on myself. If I spend 15 minutes creating, I have to set 15 minutes to do my dishes! Tracie It took me a little over a year. Tracie Title, Keywords, and Tagging! Don't give your products flowery names and descriptions. Say exactly what it is. It makes it so much easier for the customer to discover. Also, as boring as it is, take time to promote your work. If nobody sees your stuff, it will just gather dust in the virtual catacombs. Thank you, Jasmine :) And thank you for sharing my story!